60 m Van Geest Design (VGD) Sailing Yacht Design – Superyachts News, Luxury Yachts, Charter & Yachts for Sale. 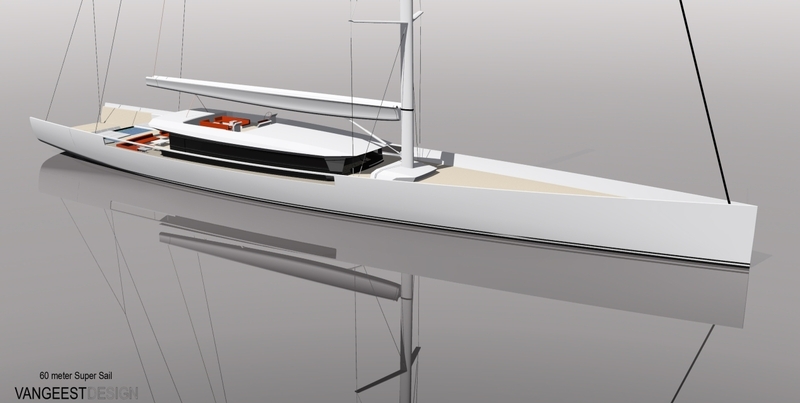 Van Geest Design (VGD) has developed a 60 meter luxury sailing yacht. The design displays an especially sleek and modern hull form and as such the fly bridge superyacht will be a true pleasure to sail cruising around or racing in the big boat regattas. This yacht design is indeed a special yachting concept of the modern sailing yacht and we look forward to seeing her built on day. As well as the amazing views, the yacht caters to helm and control stations on the flybridge as well as a lounge and dining area. The yacht’s main deck boasts a modern styled superstructure, flush foredeck and raised bulwarks. The complete package is beautifully enhanced by the clean, non-clutter look and appearance of the yacht and deck. The large main cockpit which connects to the pool and sunbathing area is situated to aft of the main deckhouse. The bulwarks are opened and fitted with glass. In keeping with the open theme of the yacht this provides a great view of the surroundings from this cockpit and from the main salon located in the main superstructure. Very interestingly, while at anchor the aft deck can be transformed and almost doubled in size by hinging out the aft hull/bulwark panels and turning them into side platforms. The owner’s cabin located just forward of this and thus link up directly with this fantastic beach area. The yacht’s transom passarelle boarding walk way also provides direct water access.